"When we do so, this allows our customers to focus on spending time with their families this holiday season, rather than worrying about combating bed bugs." 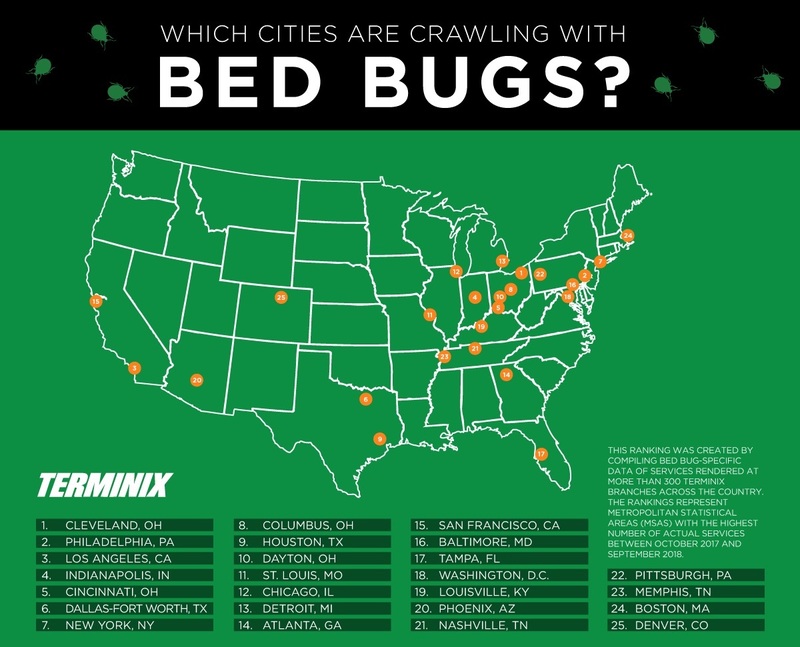 MEMPHIS, Tenn.--(BUSINESS WIRE)--Ahead of one of the busiest travel days of the year, Terminix, a leading provider of termite and pest control services and a ServiceMaster (NYSE: SERV) company, today released its 2018 ranking of the top 25 most bed bug-infested cities in the country. Cleveland crawled its way to the top of the list for a second consecutive year, followed by Philadelphia and Los Angeles. Ohio had the most cities on the list, taking four of the top ten spots. Texas, Tennessee and Pennsylvania each had two cities make the list. 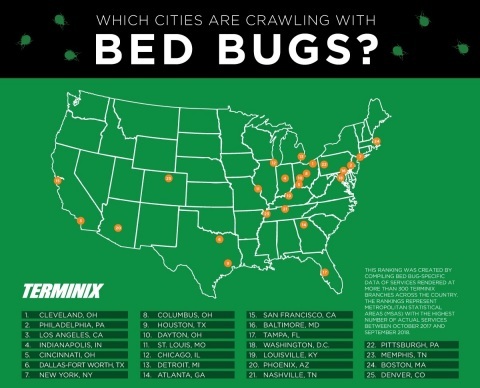 Terminix experts advise that, contrary to their name, bed bugs can be found in many household places in addition to bedding, including upholstered furniture, in curtain rods or even behind baseboards. These pests can easily hitchhike from place to place by crawling into personal belongings such as jackets, purses and luggage. As Americans travel for the upcoming Thanksgiving holiday, they should be aware of the increased potential for bed bugs to join them on their journey through airports, mass transit, hotels and rental vehicles. Travelers who believe they may have come into contact with bed bugs during their Thanksgiving vacation should take precautions to reduce their risk. Bed bugs can be killed with heat, so travelers who suspect a bed bug infestation when arriving home should launder clothing and other belongings as recommended on the clothing label, or use a portable heat chamber for non-heat sensitive items such as luggage as soon as possible. In addition, homeowners can place potentially compromised luggage in a plastic bag to prevent bed bugs from spreading among other belongings. Bed bugs are most active at night, so infestations can be difficult to spot. The bloodsucking insects are oval-shaped, wingless and reddish-brown. In lieu of spotting the pests themselves, travelers can look for signs of an infestation, which can include shed bed bug skins and blood spots on mattresses or sheets. Anyone who suspects a bed bug infestation should schedule an inspection with a pest control company as soon as possible. 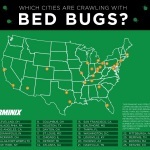 For more information, visit Terminix.com or call your local Terminix branch.